This date in 1780 saw three men and two women hanged at various spots around London for the previous month’s Gordon Riots. They were the first five souls among 19 who would suffer the last extremity of the law for that disturbance. This did not help Britain’s diplomatic overtures towards Habsburg Austria. 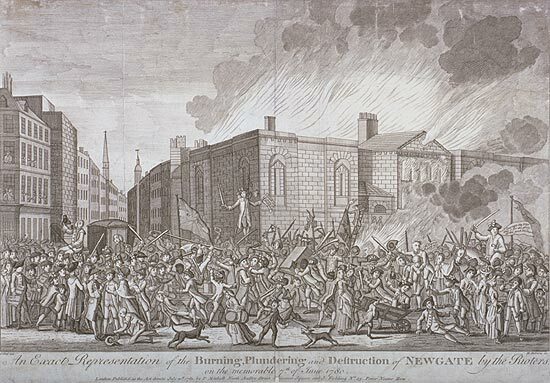 But the matter metastasized well beyond a merely sectarian event: a mass rally originating in the working-class Moorfields took an unmistakable class dynamic — assailing Newgate Prison and The Clink, liberating convicts in the process. The latter dungeon would never resume operations. “Crimping houses” for impressed sailors and “sponging houses” imprisoning debtors were also liberated. Three of the five executed in London on this date were hanged at Tower Hill, including both women, Mary Roberts and Charlotte Gardiner. Gardiner, like Glover, was an African; she and Roberts had helped sack the house of an Italian Catholic innkeeper. If I understand the temper of the publick at this moment a very great part of the lower, and some of the middling people of this city, are in a very critical disposition, and such as ought to be managed with firmness and delicacy. Less than two score were actually condemned to death for all this mess, and barely half of them were actually executed. The 19th century writer Charles Dickens set his very first historical novel,* Barnaby Rudge, during the riots, and has his fictitious lead characters among the crops doomed to the scaffold. Barnaby would have mounted the steps at the same time — indeed he would have gone before them, but in both attempts he was restrained, as he was to undergo the sentence elsewhere. In a few minutes the sheriffs reappeared, the same procession was again formed, and they passed through various rooms and passages to another door — that at which the cart was waiting. He held down his head to avoid seeing what he knew his eyes must otherwise encounter, and took his seat sorrowfully, — and yet with something of a childish pride and pleasure, — in the vehicle. 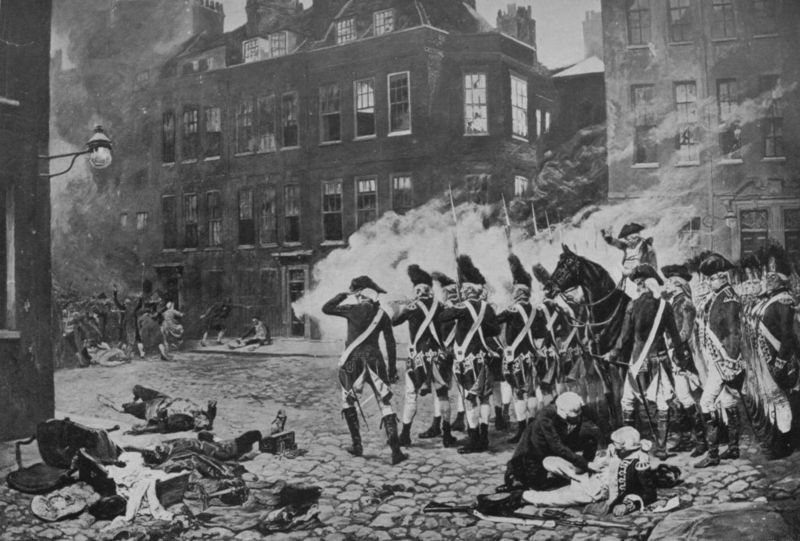 The officers fell into their places at the sides, in front and in the rear; the sheriffs’ carriages rolled on; a guard of soldiers surrounded the whole; and they moved slowly forward through the throng and pressure toward Lord Mansfield‘s** ruined house. It was a sad sight — all the show, and strength, and glitter, assembled round one helpless creature — and sadder yet to note, as he rode along, how his wandering thoughts found strange encouragement in the crowded windows and the concourse in the streets; and how, even then, he felt the influence of the bright sky, and looked up, smiling, into its deep unfathomable blue. But there had been many such sights since the riots were over — some so moving in their nature, and so repulsive too, that they were far more calculated to awaken pity for the sufferers, than respect for that law whose strong arm seemed in more than one case to be as wantonly stretched forth now that all was safe, as it had been basely paralysed in time of danger. Two cripples — both mere boys — one with a leg of wood, one who dragged his twisted limbs along by the help of a crutch, were hanged in this same Bloomsbury Square. As the cart was about to glide from under them, it was observed that they stood with their faces from, not to, the house they had assisted to despoil; and their misery was protracted that this omission might be remedied. Another boy was hanged in Bow Street; other young lads in various quarters of the town. Four wretched women,† too, were put to death. In a word, those who suffered as rioters were, for the most part, the weakest, meanest, and most miserable among them. It was a most exquisite satire upon the false religious cry which had led to so much misery, that some of these people owned themselves to be Catholics, and begged to be attended by their own priests. One young man was hanged in Bishopsgate Street, whose aged grey-headed father waited for him at the gallows, kissed him at its foot when he arrived, and sat there, on the ground, till they took him down. They would have given him the body of his child; but he had no hearse, no coffin, nothing to remove it in, being too poor — and walked meekly away beside the cart that took it back to prison, trying, as he went, to touch its lifeless hand. Gordon himself, an odd duck, had better resources than these poor saps, and repelled a treason prosecution. However, fate still ordained him a death in Newgate Prison — by illness many years later, after being convicted of defaming Marie Antoinette. By that time, the former Anglican rabble-rouser had converted to Orthodox Judaism, circumcision and all. * The first of just two historical novels for Dickens; the second, of course, was A Tale of Two Cities. ** We’ve met Lord Mansfield before, articulating the jurisprudence of a slave society. His home was also targeted by Moorsfield rioters. 1775: Maharajah Nandakumar, judicially murdered? On this date in 1775, inconvenient Indian official Nandakumar (or Nand Kumar, or Nuncomar) was hanged on a forgery charge — all too conveniently inflicted at the very time he was accusing British Governor-General Warren Hastings of corruption. Nandakumar and Hastings decidedly did not get along; the Indian believed he had been unfairly denied a plum career assignment. He leveled in response an accusation that Hastings was taking payola in exchange for his appointments. English pols involved in the administration of India, such as Philip Francis, John Clavering and George Monson, had their own rivalries with Hastings and wanted to pursue these charges. Instead, within weeks, Nandakumar was facing years-old forgery charges,* and two months after his trial, he was at the end of a rope. The certain facts are that Nand Kumar was Hastings’s enemy, that [India’s Chief Justice Elijah] Impey was Hastings’s friend; that at a moment of grave crisis in Hastings’s life, when Nand Kumar was the most eminent witness against his name and fame, that witness was arraigned on a charge that was very old, that had been suddenly converted from a civil to a criminal charge; that he was tried, found guilty, and executed. On the basis of that bare narrative of facts it would seem that if Hastings had nothing to do with the matter, he might almost as well have had as far as the judgment of posterity went. The thing was too apt, the conditions too peculiar not to leave their stigma upon the memory of the man who gained most by them. This sort of questionable administration of the crown’s possessions on the subcontinent would lead in 1781 to the Amending Act, an attempt to place India on an organizational footing more conducive to the confidence of an increasingly dubious public. that this Trial and Execution was looked upon by many of the Natives as political; nor does the Committee conceive it possible, that, combining all the Circumstances together, they should look upon it in the Light of a common judicial Proceeding; but must regard it as a political Measure, the Tendency of which is, to make the Natives feel the extreme Hazard of accusing, or even giving Evidence of corrupt Practices against any British Subject in Station, even though supported by other British Subjects of equal Rank and Authority. It will be rather a Mockery, than a Relief to the Natives, to see Channels of Justice opened to them, at their great Charge, both in the Institution and in the Use, and then Appeals, still more expensive, carefully provided for them, when, at the same Time, Practices are countenanced, which render the Resort to those Remedies far more dangerous than a patient Endurance of Oppression, under which they may labour. 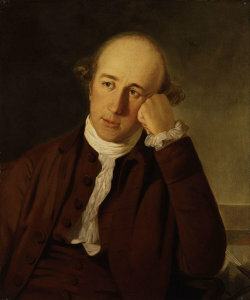 Hastings was impeached for corruption in 1787 — it took Burke, who served as one of the prosecutors, two full days to read the 20-count indictment against him, though Burke’s own attempt to add judicial murder to the bill of particulars was jettisoned — along with the now ex-Chief Justice Impey. Both were acquitted, even though investigations had laid bare a sort of endemic, routine bakhsheesh: “the native offers because he thinks he is bound to do so, and the Englishman accepts because he fears to hurt the giver’s feelings.” Hastings acknowledged availing himself of donatives, generally arguing that it was the done thing, benefited the East India Company for which he worked, and everything stayed well this side of egregious. The (lurid) conduct of this impeachment proceeding, and its effect for consolidating British imperial control away from the irregular hands of the British East India Company while generating a national mythology of missionary civilization, is the subject of a fascinating book, The Scandal of Empire: India and the Creation of Imperial Britain. Another record of the trial is available free from Google books; J. Duncan M. Derrett considers the facts of the forgery case (it “was not a judicial murder”) in the collision of Hindu and English law in “Nandakumar’s Forgery” in The English Historical Review of April 1960. * He forged part of a will to recover a bad loan. All concerned appear to agree that this charge is factually accurate, which is, of course, a long way from explaining why the matter required immediate adjudication at this juncture. Incidentally, while forgery could get you hanged in England, it was a much less serious offense under Hindu law. Part of the Themed Set: The Empire Strikes Back.